Devon Avenue in Chicago is home to several Indian electronics stores. 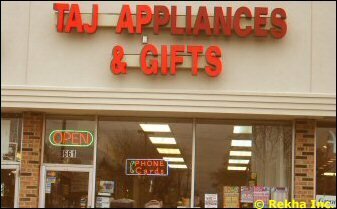 The major attraction of Indian electronics stores is the availability of 220 volt appliances that you can give as a gift to loved ones back home in India. Besides the 220 volt kitchen and home appliances, Indian electonics stores also peddle Idly cookers, rice cookers, non-stick dosa griddles, electronic roti maker and so on.